In my second stint at ThoughtWorks I spent a little over a year working on their Continuous Delivery tool GoCD, now Open Source!. Most of the time working with customers was more about helping them understand and adopt Continuous Delivery rather than the tool itself (as it should be). I use Jenkins as an example since it’s the most widespread CI tool but this is really just an excuse to talk about concepts central to Continuous Delivery regardless of tools. If you prefer I can categorically say what a pipeline is NOT: just a graphic doodle. Commitment to automation is not enough: scripting and automated testing are mostly localised activities that often create local maxima with manual gatekeepers – the infamous “throwing over the wall” – to the detriment of the end-to-end value creating process resulting in wasted time and longer cycle-times. Without geeking out into Barbara Liskov’s “The Power of Abstraction”-level of details we can say that a good design is one that finds powerful yet simple abstractions, making a complex problem tractable. And of course we believed (and I still do) we struck the right balance since we’ve been exploring, practicing and evolving the practice of Continuous Delivery from before its formal definition. 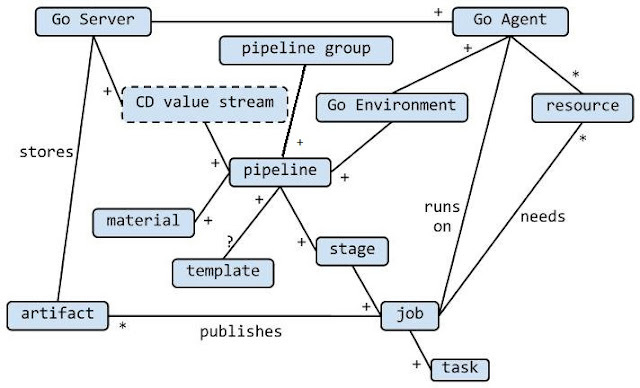 This is the reason why you are supposed to model your end to end Value Stream Map connecting multiple pipelines together in both direction – upstream and downstream – while everyone seems to still be stuck at the definition by the book that (seems to) indicate you should have one single, fat pipeline that covers the entire flow. To some extent this could be easily brushed off as just semantics but it makes a real difference when it’s not about visual doodles but about real life. It may appear overkill to have four levels of abstraction for work execution but the moment you start doing more than single team Continuous Integration (CI), they become indispensable. 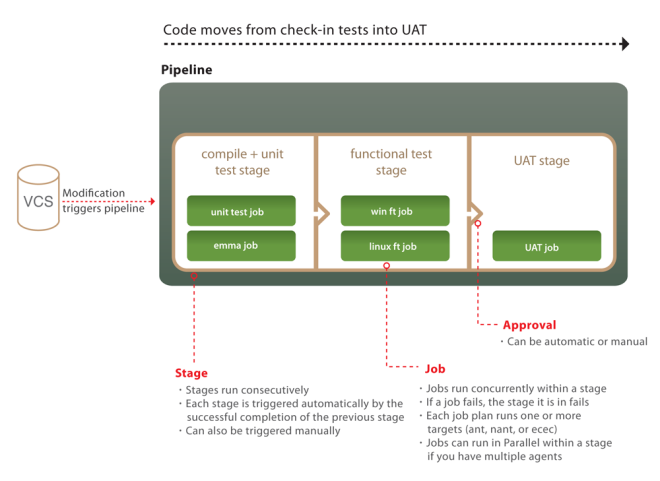 For instance, it is trivial in GoCD to set up an integration pipeline that feeds off multiple upstream component pipelines and also feeds off an integration test repository. It is also easy to define different triggering behaviours for Pipelines and Stages: if we had only two abstractions, say Jobs and Stages, they’d be overloaded with different behaviour configurations for different contexts. Jobs and Stages are primitives, they can and should be extended to achieve higher order abstractions. By doing so, we avoid primitive obsession at an architectural level. Also note that the alternating execution behaviour of the four abstractions (parallel, sequential, parallel, sequential) is designed deliberately so that you have the ability to parallelise and sequentialise your work as needed at two different levels of granularity. Not all Pipelines are created equal, let’s see why the above points are important by looking at how they are linked to the CD best practices. Last but not least Pipelines as first class built-in concepts are part of the reason why we were able to release the first ever (and at the moment still only, AFAIK) intelligent dependency management to automatically address the Dreaded Diamond Dependency problem and avoid wasted builds, inconsistent results, incorrect feedback, and running code with the wrong tests: in GoCD we called it Fan-in Dependency Management. GoCD’s Fan-in material resolution ensures that a pipeline triggers only when all its upstream pipelines have triggered off the same version of an ancestor pipeline or material. This will be the case when you have multiple components building in separate pipelines which all have the same ancestor and you want downstream pipelines to all use the same version of the artifact from the ancestor pipeline. 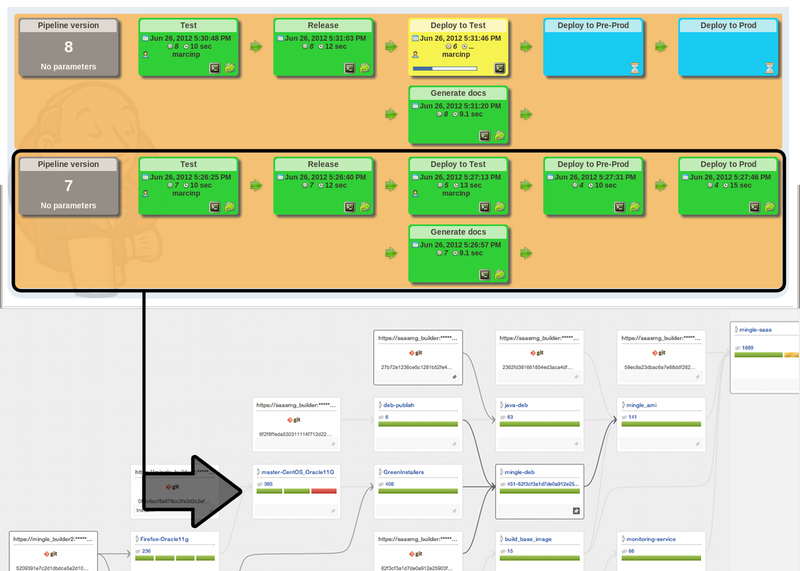 and last but not least take a look at how a Value Stream Map visualisation helps the Mingle team day in, day out in Tracing our path to production. Despite being almost a year old this post still gets lots of viewings every single day. For an update on the latest relevant plugins in the Jenkins space take a look at Max Griffiths article Go CD – The right tool for the job?